I don't if you are interested in what films people search for most often on this site - it's something which fascinates me. I am grateful for (most) comments that folk leave and I'm always up for a conversation - and very happy for people to see things differently. 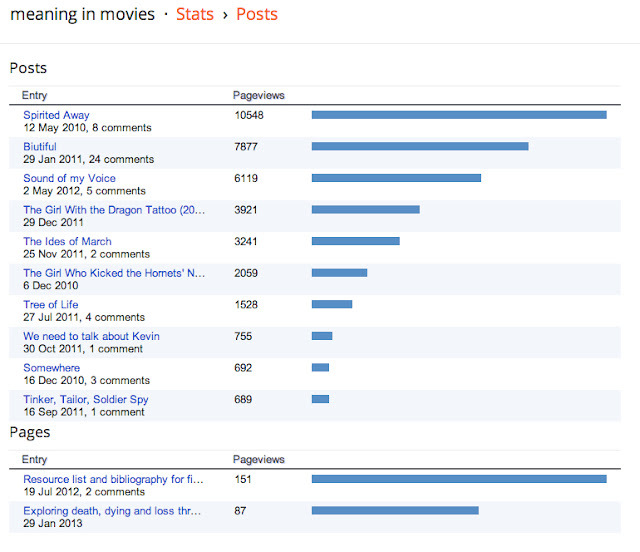 If you are interested in what people are looking at, here are the viewing stats as of today. Thanks for your interest. As you can see Spirited Away is out in the lead but given that Sound of My Voice was only posted a year ago, it is catching up quickly. One film that ranks quite highly but is not in the top 10 is Cloudy with a Chance of Meatballs! Why?